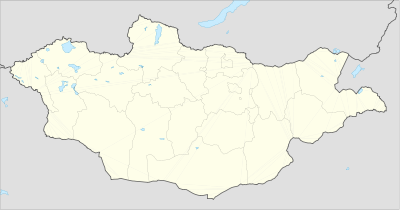 This is a list of cities in Mongolia. The following table includes cities of more than 7,500 inhabitants. The results are from the census of January 5, 2000 as well as from a population estimation for the end of 2008. If 2008 year data was not accessible, the closest and most reliable data was used and noted by an index. The population for previous years show the historical significance of population growth and urbanisation throughout Mongolia. Salmon cells indicate that the population has declined or experienced minimal (<1%) growth. Light green cells indicate a growth between 1-2%. Dark Green cells indicate a growth of greater than or equal to 2%. ^ (2000) PADCO: Mongolia Urban Development and Housing Sector Strategy, Final Report, Vol. 2, published 2005. ^ "Mongolia extended population statistics". GeoHive. 2015. Archived from the original on 15 November 2015. City Population - Historical population figures. This page was last edited on 19 April 2019, at 10:55 (UTC).